Stimulate your child's imagination and create a fun and safe play area in your backyard with our quality playhouses, available in 2 unique lines to match your style! 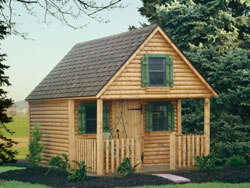 Our cozy cabin playhouses add rustic charm and a feeling of adventure to your outdoor space. Available in 4 design styles, these small cabins become the ultimate getaway or 'hideout', right in your backyard. 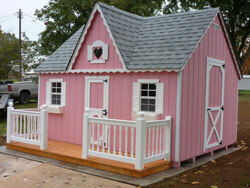 Our elegantly designed Victorian playhouses aren't just for show! They're the perfect place for tea parties and secrets! Available in 2 unique designs, complete with window boxes, shutters and many optional features, these playhouses add an elegant flair to your backyard, while providing a safe and fun place for imaginative play. For pricing and purchasing information for our playhouses call (724) 947-9741 or fill out our convenient contact form! You can also take a look at our Site Preparation Guide to find out more about how to prepare your site for your new playhouse! Yoder's Backyard Structures is committed to providing you with the best service possible. Our experienced staff can help you decide on the shed that's right for you. It is our promise to make this purchase an enjoyable one for you. Call (724) 947-9741 today to talk with our knowledgeable staff and get all your questions answered before you buy!